Setting a Summer Reading Project - Dave Stuart Jr. In my last post, I suggested that there's a time to take on no new reading at all, instead setting one's course for the full exploration of a single book. 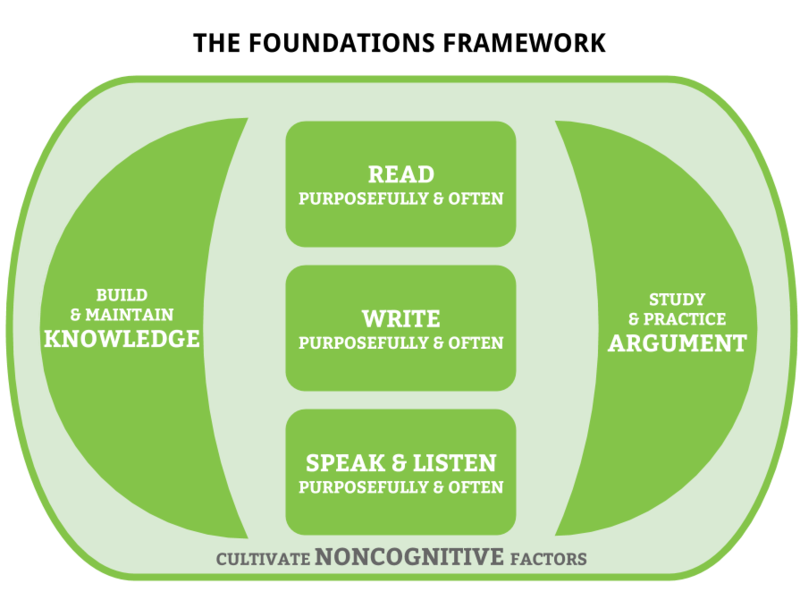 I did this five years ago or so with Mike Schmoker's Focus, and much of the subsequent blogging and teaching I've done (including the development of the Non-Freaked Out Foundations Framework — see Figure 1) has grown from that year of focused study. However, I'm certainly not doing that this summer. This summer, I'm completing the reading project I've been working on for the past twelve months or so: finalizing the literature base for the book I'm writing, which happens to be a book on the NFO Framework. Figure 1: The Non-Freaked Out Framework serves not just as a tool for focusing our instruction, but as a tool for focusing our professional reading as well. Below, you'll find the new books I've read or have yet to read, organized by Framework component. Keep in mind, of course, that my approach to professional reading is atypical for most teachers; I lay that approach out here, here, and here. The best book on this topic isn't a book, it's a critical literature review. It's free, too: Camille Farrington et al's Teaching Adolescents to Become Learners. This provides a masterful overview of how noncognitive factors work together; it's much more coherent and usable than the character strengths I used to write about all the time. Paul Tough's How Children Succeed and its epilogue, Helping Children Succeed. Tough is an able reporter on the developing story of what he calls American education's cognitive hypothesis — the belief that we ought to just aim at making kids smarter. Shawn Achor's Happiness Advantage. Achor is being cited a lot at my school recently, so I'll be re-familiarizing myself with his work this summer. Heidi Grant Halvorson's 9 Things Successful People do Differently. Halvorson, like many of the authors on this list, targets business-people, but I find her tips frequently applicable to my ninth grade classroom. I'm excited about Eric Barker's Barking Up the Wrong Tree. His blog of the same name has given me some insights that I've passed along to my students and put into practice myself. More: David Brooks' The Road to Character, Jess Lahey's The Gift of Failure, and Daphna Oyserman's Pathways to Success through Identity-Based Motivation. This has been one of the more uncharted areas of the Framework, but it's starting to cohere now thanks to the resources below. First, it's important to understand how the brain works. For this, I like Barbara Oakley's A Mind for Numbers: How to Excel at Math and Science, Peter Brown, Henry Roediger, and Mark McDaniels’ Make It Stick, and basically any of these articles by Daniel Willlingham. Then, we need to understand why knowledge matters (to literacy, to thinking, to knowing more) and how we might go about creating knowledge-rich curricula. For this, I find E. D. Hirsch, Jr., the must-read writer. His books Why Knowledge Matters, The Knowledge Deficit, and The Schools We Need and Why We Don't Have Them have given me some important insights. If you've been around a while, you know my thoughts on argument: it's not central enough to American schooling, despite its centrality to a life of the mind. Here's an annotated list of five great approaches to teaching argument. The central components of the NFO Framework are the “literacy as usual” bits, and for help understanding how these things ought to be approached, it's sometimes more manageable to ask, “How does one particular teacher-thinker I respect approach these things?” Toward that end, a reading of the most recent works by Jim Burke, Kelly Gallagher, Kylene Beers, Penny Kittle, or other NCTE-rockstar-types are a good place to spend a reading project. Erik Palmer's Well Spoken. The book that brought us PVLEGS — enough said. Thank you to Evan Freemyer for having me write this post. Have a great summer, Evan!